Sylhet Agriculture University (SAU) admission notice for session 2015-16, Last week Sylhet Agriculture University has published admission notice on their website. Online application will be started from 14th October and it will continue till 18th November 2015. Those who interested to attend in the admission test exam, they need to apply through online. Candidates have to be science background. Those who passed SSC in 2012 or 2013 and HSC in 2014 or 2015 only they can apply in the SAU admission test exam. Their CGPA must be total 6.5 and individual CGPA is not less than 3 without 4th subject. Student must be obtain 3 in each individual subject Physics, Chemistry, Biology, Mathematics and 2 in English. Go to the website sau.ac.bd and fill up the form. A pin number will provide to you. It is important for pay the application fee. You have to pay 800 taka including application fee. After completing your payment you receive a confirm SMS. Sylhet Agricultural University Admission Admit Card: Apply candidate must collect their admit card within 22 November to 25 November 2015. When you collect your admit card you need your pin number. Upload your recent photo. Passport size photo must be (160X200) and jpg format. A4 size paper use to download the admit card. Without admit card you cannot enter into the admission hall. 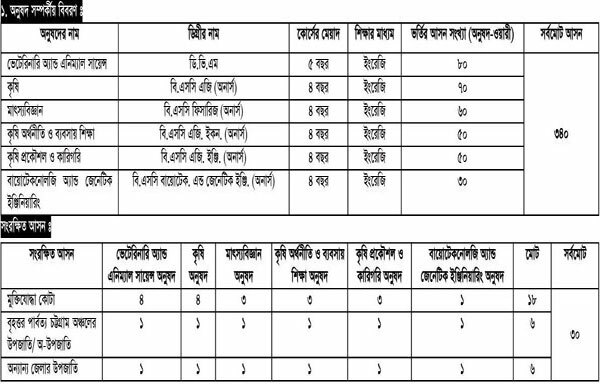 Sylhet Agricultural University Admission Test Seat Plan: Seat plan will be published for the interested applied candidates at 26st November 2015. Seat plan will be publish at varsity official website. Sylhet Agricultural University Admission Question Solution: Exam is fully MCQ based. Exam duration is one hour. Total mark is 100. After complete the exam question solution is provided on our website. Sylhet Agricultural University Admission Result:Exam result will be given at 30 November. Result will publish at the official website.